In this Nov. 1, 2017, file photo, a computer screen shows the enrollment page for the Affordable Care Act in Miami, Florida. 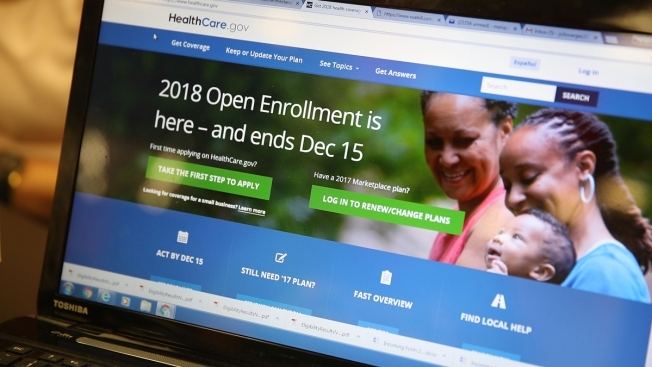 A new lawsuit being filed Thursday argues that President Donald Trump’s efforts to make good on his promise to "let Obamacare implode" on its own violate the U.S. Constitution, NBC News reported. Trump has “waged a relentless effort to use executive action alone to undermine and, ultimately, eliminate the law,” the complaint says, according to a draft obtained by NBC News. The lawsuit is being filed in Maryland federal court by the cities of Chicago, Columbus, Cincinnati and Baltimore. The suit specifically argues that he is violating Article II of the Constitution, requiring the president to "take care that the laws be faithfully executed." Since his first executive order directing federal agencies to claw back as much of the Affordable Care Act as possible, Trump’s directives have increased health coverage costs and depressed enrollment, the complainants say.